This is not a story that we see too often when it comes to Google. The company has just released an update to the Google Play Books app for iOS and it brings new features that don't even exist on Android yet. The major update that comes with Google Play Books version 1.3 for iOS is the ability to select text, which cannot yet be done on Android, and everything else flows from there. Once you select text, you can now highlight and annotate that text, and those annotations will sync to your other iOS devices and to the Web Reader. Although, it should be noted that notes are private only right now and there's no functionality like that found on Kindle which will show you the most popular highlighted passages in a book. You can also translate the selected text into one of over 50 languages, get a definition of a word, or search for the selected word or phrase on Wikipedia or Google. That's a pretty sweet set of updates. In addition to all those goodies, you can also set bookmarks, share books on Google+, and view your library as either a grid or a list. We would expect that these options would be hitting Android sooner rather than later, but as yet these are iOS-only. 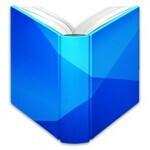 So, if you want to get in on this, you can get Google Play Books for free in the iTunes App Store.